Contents: Preface: The Pattern Which Connects. Part I: Language, Learning, and Teaching. Language: Concepts and Precepts. Learning: Factors and Processes. Teaching: Input and Interaction. 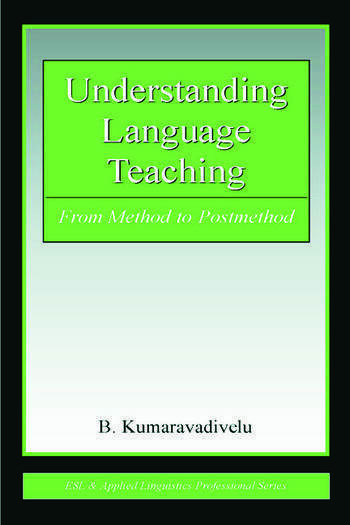 Part II: Language Teaching Methods. Constituents and Categories of Methods. Language-Centered Methods. Learner-Centered Methods. Learning-Centered Methods. Part III: Postmethod Perspectives. Postmethod Condition. Postmethod Pedagogy. Postmethod Predicament. Postscript: The Pattern Which Comforts. "By bringing the concepts of method and postmethod together in one text, this book is certain to be adopted by TESOL programs that value tradition, yet recognize the need for innovation, especially in light of the geopolitical complexities of ELT....It will become a key text in shaping future developments in our field."